The compelling and cinematic second novel from Belinda Jeffrey, author of Brown Skin Blue. 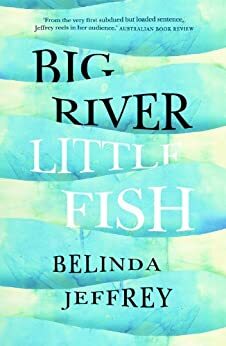 Big River, Little Fish is the highly anticipated second novel from Belinda Jeffrey. Set in South Australia during the 1956 Murray River flood, it tells the story of Tom Downs, a boy trapped between his way of reading the world and the world's way of seeing him. He lives in the town but likes it best down by Old Mother Murray, talking to his best friend, Hannah, and helping the outcasts who live in the shacks on her banks. But there's a big river coming and Tom feels like everything he loves and understands might be swept away and lost. From the moment Tom Downs was born backwards  the moment of his mother's death  time has held him the wrong way round, like he's caught inside a fractured story. But the thing about the Murray River rising, the thing about Tom's town flooding, and the thing that takes him by surprise is not what Old Mother Murray takes away, but who she brings back. 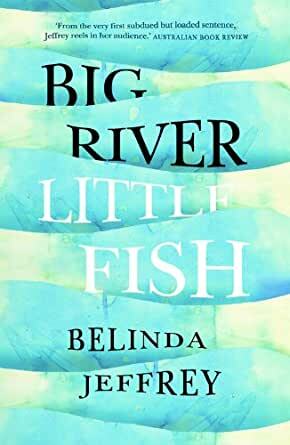 Big River, Little Fish is a compelling tale of a boy growing up into manhood set against the dramatic and beautiful scenery of the Murray River in South Australia. ‘Some times you gotta trust life to hold you up, Little Fish’ (p.17). Born ‘backwards’ at Big Bend on the Murray River in South Australia, Tom Downs’ fifteen years have been difficult. He has always found that things at school like reading and writing did not come easy. Yet it seemed natural to immerse himself in the wisdom of Old Mother Murray and he was happiest when caring for the vulnerable riverbank dwellers, feeding the neighbour’s lambs, helping his foster dad fix a car or tractor or riding a Harley. Yet the unanswered questions surrounding his mother Lil, who died giving Tom life, his father’s rejection and his adoption by Ted and Marge continually swirl around him. When the worst floods in a century threaten Swan Reach, Tom must come into his own. Belinda Jeffreys uses different voices including those of Tom, his father Oliver, Ted his foster father and Murray, who found Tom as a baby, to weave an intricate plot with some surprising twists. Each character is depicted in rich detail and with great compassion. The pieces in the complex puzzle surrounding Tom’s life are skilfully brought together in the final pages. While attending carefully to the historical events of the flood, Jeffreys also evokes its physical power and inevitability. The personal and physical devastation wrought by the flood are described with great sensitivity, and the image of the river as the lifeblood of the town and its people is - masterful. Loved this book! Beautiful story and captured the essence of South Australia and the Murray. A great book to get lost in.